Lock in a great price for Scandic Aalborg City – rated 8 by recent guests! Friendly customer service and reception staff. Good cleaning. Tasty breakfast. We were given a nice warm and cosy room. The double bed and tub were as requested. The bed and pillows were really comfortable.The frokost was of good quality and hot. Good location for konserthus ! Probably the best breakfast in Northern Jutland. The soft boiled eggs are softboiled if you know what I mean. All organic, fresh and even small nudging signs to avoid food waste. Excellent choices of coffee. The hotel was very close to the train station, (a 5 minute walk), and yet very quiet. It was also a short walk to Kunsten, and also the town-centre and river-side. There was lots of choice at breakfast and it was all delicious, and the beds were comfortable. The little shop was helpful. Best vegan breakfast ever! Huge selection of choices, particularly good for Denmark! Staff were super friendly and helpful. Good standard in general. Good breakfast. Conveniently located to city centre and easy access by car. We were given a nice, large, cosy room near the lift, as requested. The decor was pleasant and it was clean. The tub was given as an upgrade. Always worth an ask ! The wifi and guest computer printer worked well. The frokost was very limited, but of good quality. The hot items were hot and the cold items cold. The crispy bacon was excellent ! Scandic Aalborg City This rating is a reflection of how the property compares to the industry standard when it comes to price, facilities and services available. It's based on a self-evaluation by the property. Use this rating to help choose your stay! 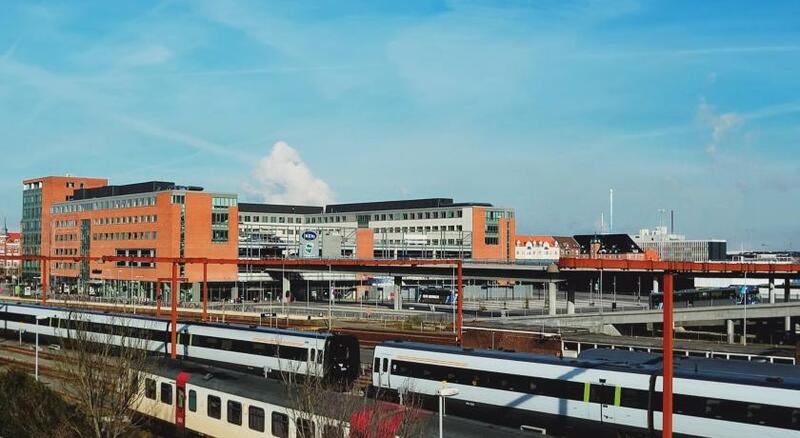 This hotel is directly connected to Aalborg Congress Center and 1,300 feet from Aalborg Station. It offers free WiFi and a popular, organic breakfast. Kunsten Art Museum is within 10 minutes’ walk. Scandic Aalborg City's bright, modern rooms feature colorful décor and Scandinavian-styled furnishings. Each has a work desk and satellite TV. Most offer excellent views of the city. Free internet computers are found in the lobby. Staff can recommend area attractions such as Aalborg Zoo, which is within 5 minutes’ drive of Scandic Aalborg City. When would you like to stay at Scandic Aalborg City? This room includes a flat-screen TV and desk. Private parking is available on site (reservation is needed) and costs DKK 125 per day. This room features tea/coffee facilities and bathrobes, as well as a flat-screen TV and desk. This spacious, city-view suite features a separate bedroom and living room. It also has a desk, tea/coffee facilities and bathrobes for added comfort. Please note that baby cots and extra beds cannot be accommodated in this suite. House Rules Scandic Aalborg City takes special requests – add in the next step! Scandic Aalborg City accepts these cards and reserves the right to temporarily hold an amount prior to arrival. Gym room is as small as single room. Not much equipment. No drinking water in the room, no towel for the floor, no tea/coffie in the room. BBC world on the list but not available. it’s getting very basic. bed was uncomfortable and not even a cattle in the rom. no water pressure on the shower. No guest computer or kettle. Wifi flaky. Frokost a bit limited. Builders having conference in restaurant at 9.30am.!! Surely they could have waited until service was over? Hotel parking offer is 125 DKK per 24 hours. Parking outside in the open space will cost you less than 25 DKK for 24 hours. You can even park in the CarPark 100 meters away. It will cost you less than 25 DKK per 24 hours. At stå i kø 1/2 time for at komme til morgenbordet. Var træls. Great welcoming, nice bedroom, great breakfast. Climate control didn’t work (managed by the reception). Which meant that the room was extremely hot. The breakfast felt a bit stressfull because of the open, crowded room. Close to the Trainstation. Comfortable beds. Nice room. Friendly staff. We were sad there were no tea & coffee making facilities in the room.